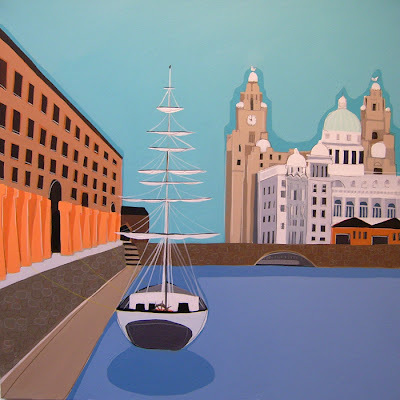 This was one of the finished paintings for the new gallery in Liverpool, it opens 29th February. I will give more details when I know them. It was nice to paint older bulidings, not something I'm used to. all that comes to mind is this word: REGAL! I love the sharpness of these colours! They seem to really have a feeling of the city. just read your comment on Sykos blog *BEAM*!!! i love the extra details on this one, especially all the sails on that ship. can't wait to see more, sorry you couldn't take that walk too!